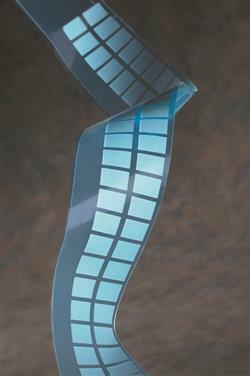 3M(TM) Thermally Conductive Adhesive Transfer Tapes 9882, 9885, and 9890 are used to mechanically and thermally bond electronic components (packages and flexible circuits) to heat sinks or heat sensors. These tapes allow for easy joining of many substrates with light pressure in just seconds at room temperature. 3M(TM) Thermally Conductive Adhesive Transfer Tapes are permanently tacky tapes consisting of a 2.0 mil, 5.0 mil, or 10.0 mil thick pressure sensitive adhesive (PSA) film filled with ceramic particles. These particles allow thermal conduction through the tape. The tape yields an excellent combination of thermal conductivity, electrical isolation and adhesion. The transfer tape format means there is no carrier layer, which allows for superior gap filling between the bonded substrates. This improved contact results in higher bond strength and lower thermal resistance. The PSA properties of these tapes make them easy to handle and apply without need for thermal bonding. These tapes are also repositionable and reworkable during assembly, and the final bond is permanent, eliminating the need for clamps and screws. All three thicknesses meet NASA low outgassing specifications (NASA SP-R-0022). Jaco Aerospace and Industrial is your one stop resource for 10.0 mil thermally conductive adhesive on 2.0 mil, polyester liner. For mounting thermoelectric cooling modules, bonding heat sinks to microprocessors, bonding TAB-mounted IC and power transistor to PCB, and power transistor to heat sink. and all of your 3M Products, Tapes, aerospace and industrial needs.